Ben Bradlee was a fixture on the American scene for nearly half a century—a close friend to John F. Kennedy; the center of D.C. social life; and a crusty, charismatic editor whose decisions at the helm of the Post during Watergate changed the course of history. 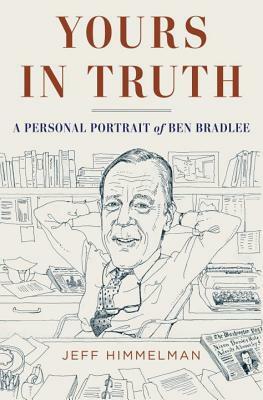 Granted unprecedented access to Bradlee and his colleagues, friends, and private files, Jeff Himmelman draws on never-before-seen internal Post memos, correspondence, personal photographs, and private interviews to trace the full arc of Bradlee’s forty-five-year career—from his early days as a press attaché in postwar Paris through the Pentagon Papers, Richard Nixon’s resignation, the Janet Cooke fabrication scandal, and beyond. Along the way, Himmelman also unearths a series of surprises—about Watergate, and about Bradlee’s private relationships with Post owner Katharine Graham, reporters Bob Woodward and Carl Bernstein, and President Kennedy and his wife, Jackie. “Don’t feel that you have to protect me,” Bradlee told Himmelman whenever the reporting started to strike close to home. “Follow your nose.” Those instructions, familiar to any Post reporter, have resulted in this thoughtfully constructed and beautifully written account of a magnetic man whose career has come to define the golden age of newspapers in America, when the press battled for its freedom—and won. Jeff Himmelman is a contributing writer at The New York Times Magazine, where he has been a finalist for a National Magazine Award; his writing has also appeared in New York, GQ, Washingtonian, and The Washington Post. His work with a team of reporters at the Post helped the paper secure the national reporting Pulitzer Prize for its post-9/11 coverage. He is also a professional musician who writes, records, and performs under the name Down Dexter. He lives in Washington, D.C., with his wife and three daughters.